Prompted by an awareness of the fact that the average secondary school teacher has neither the time nor the opportunity to keep up with monographic literature, these pamphlets are specifically designed to make available to the classroom instructor a summary of pertinent trends and developments in historical study. In the late 1950s, one of the “pertinent trends and developments in historical study” was the history of science. 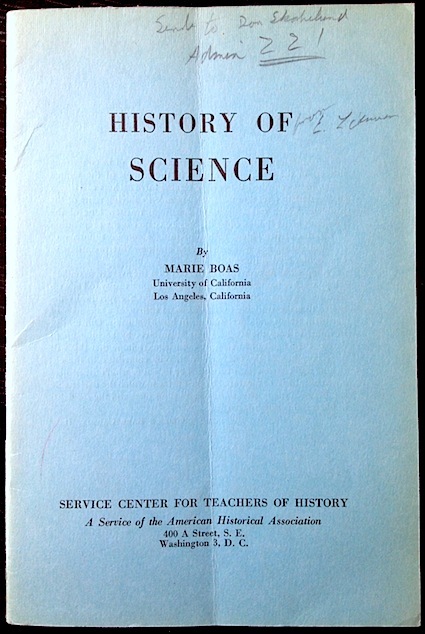 To address this trend, the “Committee on Teaching” convinced Marie Boas to write a pamphlet for high school teachers introducing the history of science to them. In an age when high school students regard space travel as an eminently attainable and desirable practicality, it is hardly necessary to emphasize that we live in a civilization infused by and dependent upon applied science. It has indeed been plausibly argued that what distinguishes the most recent period of history, and particularly the history of Western Civilization, from other ages and from the whole history of other civilizations, is precisely the triumphant justification by results of that scientific method which first clearly emerged in the seventeenth century. If this is true—and there are cogent arguments to support it—then to study the history of our culture without studying the development of science within that culture is clearly to render any historical appraisal both incomplete and distorted. Further, she suggests, the history of science appeals to “curiosity about the world around them which is so natural to most boys and girls.” The history of science engages those students whose interest lies in the sciences by offering a “valid and useful point of contact with history.” At the same time, history of science offers students baffled by science “some insight into the scientific point of view“ so common in the late 1950s. In one passage, Boas laments the struggles of past and present scientists: “One of the perennial problems of the scientist has been how to earn his livelihood.” Despite the increasing demand for scientists in universities and industry, “scientists have often grievously felt the lack of adequate funds and facilities … and the attempts of scientists to gain funds from governments, especially from democratic governments, presents a fascinating study of the relation of the scientist to the society in which he lives.” While some individual scientists today may want more money, it’s difficult to see the sciences as struggling or as underfunded. And salaries in the sciences are not particularly depressed. The history of science is a most rational and fascinating story; yet the study of the history of science is in a lamentable state: the literature of the field is often pseudo-scholarly and largely unreadable. The faults which have given rise to this situation, I shall argue, stem from the uncritical acceptance, on the part of historians of science, of two incorrect philosophies of science. These are, on the one hand, the inductive philosophy of science, according to which scientific theories emerge from facts, and, on the other hand, the conventionalist philosophy of science, according to which scientific theories are mathematical pigeonholes for classifying facts. The second, although some improvement over the first, remains unsatisfactory. A third, contemporary theory of science, Popper’s critical philosophy of science, provides a possible remedy. On this view, scientific theories explain known facts and are refutable by new facts. It is little surprise to see Joseph Agassi supporting a version of Karl Popper’s philosophy. From Joseph Agassi, “Introductory Note” to Towards an Historiography of Science . I am as amused by his criticism of scholarship in the history of science as I am unconvinced by his proposed solution. To prompt debate and structure discussion, the organizers of last weekend’s workshop offered the following provocations about STS and the scholars who work within it. I am both encouraged by some of these topics and daunted by some. If you have any thoughts or comments, I encourage you to address them in a post, and link back to here so I know you wrote about them. Let’s use these as an opportunity to have a broader discussion about what STS offers to students, institutions, businesses, and government. 1 :: STS works on the cutting edge of our world’s grand challenges. STS tackles some of the most central problems of our contemporary world. In our age of information technology, global warming, and bioengineering, STS scholars are providing essential analytical and normative insights into the complex linkages between what we build, what we know, and who we are. As such, STS is one of the most vibrant fields of study and deserves to be funded by government agencies and universities. 2 :: STS offers several paths to policy-relevant scholarship. In addressing fundamental questions facing our world, STS scholarship often tackles matters of contemporary policy relevance, such as the ethical, legal, and social implications (ELSI) of emerging and controversial fields of study. But these considerations of policy or ELSI relevance should not be the sole measure for evaluating the contribution of STS to public policy. Much STS work is powerful because it offers critical frameworks that can allow policy makers to rethink what constitutes fundamental concepts such as “science” “society” and “policy.” Therefore, we must promote and fund a spectrum of research projects including those that analyze the pressing questions of public policy as well as those that help us conceptualize which policy questions we should be asking in the first place. The links between STS and public policy should be understood broadly. 3 :: STS is more than simply the sum of a variety of disciplinary perspectives. While history, philosophy, anthropology, sociology, political science, and other disciplines have contributed immensely to our understanding of science and technology in society, STS is a distinct field of study that offers unique insights unattainable through the agglomeration of existing perspectives. STS, while drawing on other approaches, has a disciplinary standing of its own. It merits having its own departments, curricula, and standing. Universities cannot expect rigorous education of their students in the social and cultural dimensions of science and technology without dedicated programs and faculty members. 4 :: STS scholars are responsible for the field’s institutional standing. STS scholars must take responsibility for the institutional security of the field. We cannot expect others to do it. Nor can we assume that once programs are created, they will be automatically sustained. As scholars, teachers, and members of universities, we must take the initiative to demonstrate the relevance and need for STS scholarship and push to secure lines of funding for its practitioners. Academic fields are not natural kinds. They are social constructs whose boundaries can be shaped by STS scholars and must be maintained through practice. 5 :: Funding agencies and STS scholars should work together. The vast majority of scientific funding agencies recognize that it is important to support research into the societal dimensions of science and technology. In order to ensure that these funds promote cutting-edge scholarship, funding agencies should be willing to work with STS practitioners to make sure that their categories and grant structures are consistent with the research practices of the field. Similarly, STS scholars should be willing to work with funding agencies to help them identify promising research opportunities that can support the organizations’ missions. Collaborative dialogue can produce improved results for both funding agencies and STS scholars. 6 :: STS scholars should collaborate to provide consistent graduate education. One of the hallmarks of conventional academic disciplines is a recognized canon of literature and set of methods. While different programs will likely emphasize different analytical approaches, STS scholars should work together to create a few broad frameworks for teaching our students the intellectual foundations of our field.